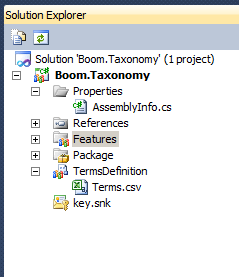 This entry was posted on September 1, 2010 at 23:31	and is filed under SharePoint 2010, Visual Studio 2010. 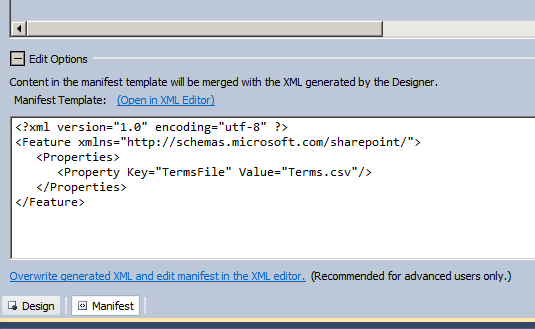 Tagged: API, Content Type Syndication, Metadata, Service Application, SharePoint 2010, Taxonomy, Term Set, Terms. You can follow any responses to this entry through the RSS 2.0 feed. You can leave a response, or trackback from your own site. for example i want the Sales term value in English and Arabic? I will have to check. I have not tried multiple languages yet. The theme is one of the available WordPress themes, called Andreas09. Thanks for u r post , nice article. Thanks! Glad you enjoyed it. Happy New Year. Great post! However, I’m having a few issues that you might be able to help with. My feature is activated on site provisioning. When I call CreateGroup on my TermStore, I get an exception saying that the current user does not have permissions to do this. When my feature is activated manually via stsadm, it works fine. So I gave my application pool account permissions on the managed metadata service via central admin, but it still fails on deployment.